The Bossi Castle is located in the town of Castelnuovo Berardenga. Evidence shows that this land was once a Roman settlement. The landscape is unique and beautiful thus inspiring great thinkers, poets and artists throughout the centuries. 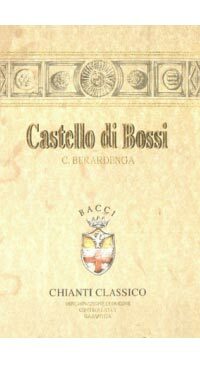 The Castello Bossi estate was founded in 1983 and has evolved with the times with Marco Bacci at the head of its success. Marco overseas the estate and his vision has brought the Castello Bossi to the highest ranks in international wine. In the last 10 years, Marco has added two properties to his holdings; Renieri in Montalcino and Terre Talamo in Morellino di Sansano. Lifted notes of bright cherry, blackberry and dried cassis. The warmth of the vintage and the compact soils of Castelnuovo Berardenga in the southern part of the Chianti Classico zone, contribute to fruit ripeness and the wine’s concentrated palate and chewy tannins. This is one of my favorite Italian wines and the first wine I tend to reach for each Autumn when the nights cool off. Made with 100% Sangiovese in the Classico region of Chianti this wine shows expressive aromas of cherry, blackberry and florality. There is a lot of structure in this wine and it carries the fruit flavours well. The tannins is this wine are plentiful yet very fine and velvety. This wine is perfect when paired with a simple homemade pizza and a good book.